VANCOUVER, BRITISH COLUMBIA--(Marketwired - Jan. 29, 2018) - Orca Gold Inc. (TSX VENTURE:ORG)("Orca" or the "Company") is pleased to announce a new Mineral Resource Estimate for the Company's Block 14 Gold Project in the Republic of the Sudan. *The Mineral Resource Estimate is reported at a 0.60 g/t gold cut-off grade, based on the Revised PEA average cut-off grade calculation (News Release, May 30, 2017). The Mineral Resource Estimate was undertaken by MPR Geological Consultants of Perth, Western Australia ("MPR") as part of the Feasibility Study in progress. MPR estimated mineral resources for the GSS and Wadi Doum deposits using Multiple Indicator Kriging ("MIK") based on mineralised domains interpreted by MPR and Orca. The new Mineral Resource Estimate is based on an additional 12,449m of diamond drilling in 34 holes, assayed sections of a further 15 geotechnical core holes and 2,806m of reverse circulation ("RC") drilling in 14 holes completed at GSS. The resource dataset now comprises 98,754m of drilling in 688 holes. No drilling was completed at Wadi Doum in this first phase of the ongoing programme. Samples used for the results described herein were prepared and analyzed by fire assay using a 50 gram charge at the ALS Chemex facility at Rosia Montana in Romania in compliance with industry standards. Field duplicate samples were taken and blanks and standards are added to every batch submitted. The recent drill programme has resulted in significant advances in the understanding of the geology at GSS. A three-dimensional lithological model has now been developed providing a more accurate framework for the Mineral Resource Estimate and further exploration. Drilling will resume at GSS by the end of January 2018 to continue the conversion of Inferred resources to Indicated category based on this new lithological model. 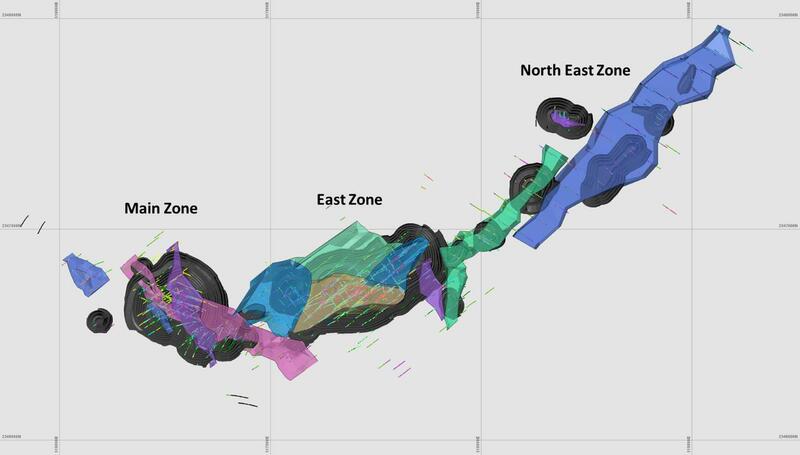 The combined GSS strike length is 3.5km (see Figure 1) and the mineralisation remains open in all directions. Drilling is also planned at Wadi Doum to extend the resource at depth and follow up on a number of shoots that are expected to add further higher-grade material to the deposit. Commenting on the new Mineral Resource Estimate, Richard Clark, CEO and Director of Orca Gold, said "the recent drilling at GSS has successfully increased the indicated resource at GSS. The conversion of inferred resources and the addition of new resources at GSS supports continued drilling to expand the scope of this exceptional deposit even further. Our resource expansion programme will also extend to the Wadi Doum deposit with an objective to increase the tonnage of higher grade material that will be mined in the early years of production. We look forward to further announcements based on ongoing drilling culminating in the delivery of the Feasibility Study in early Q2 2018." Orca Gold Inc. (TSX VENTURE:ORG) is a Canadian resource company focused on exploration and development opportunities in Africa, where it is currently focused on the development of its 70%-owned Block 14 project in the Republic of the Sudan. The Company has an experienced board of directors and management team and a strong balance sheet. The Mineral Resource estimate was carried out by Mr. Nicholas Johnson of MPR Geological Consultants of Perth, Western Australia who is considered to be independent of Orca Gold Inc. Mr. Johnson is a member in good standing of the Australian Institute of Geoscientists and has sufficient experience which is relevant to the commodity, style of mineralization under consideration and activity which he is undertaking to qualify as a Qualified Person under National Instrument 43‐101. Mr. Johnson consents to the inclusion in this press release of the information, in the form and context in which it appears.